What a gloriously gorgeous day it has been today. To be outdoors working on the chicken coop without a jacket on of any sort and to be perfectly comfortable, even a little warm. The sun shone and the sky was a brilliant blue. There was a bit of gusty breeze but it wasn’t a cold breeze. We’ve had the door to the deck open most of the day and the cats have been happy as can be. It’s funny how in fall 58F/14C feels a little chilly but in spring it feels so very warm. Bookman and I got the rafters up on the coop today. It went along really easy because Bookman had the brilliant idea of using two C-clamps to hold the rafter on instead of me trying to hold the rafter still while he drilled. It went so fast and easy we didn’t know what to do after that because we had expected it to be a thing. So we measured a board to attach the run door frame to and then attached that to the coop. And then we put up another board on the other side of the run for attaching hardware cloth to and then there was nothing else to do because we need hinges for the door before we build the door frame so we know if we need to make any allowances for the size of the door to fit it into its allotted space. And we are also ready to start cutting plywood. But the plywood is under a tarp that still has a bit of snow and ice on it and we didn’t feel quite prepared to remove the tarp and start figuring it all out. That will be for the next nice weekend. It feels good to be making progress on the coop again. We still have a lot to do but all the structural framing and stuff is all done. In some ways that feels like the hardest part. Now we just have to fill it all in. The seed starting continues apace. The onions and leeks are doing great. The tomatoes have a few tiny sprouts. The peppers still have not decided to give me any satisfaction. I think they might not be warm enough or getting enough light so I now have a lamp shining on them when the sun is not which is about half the time. Hopefully that will be enough to encourage them to get going. If not, I guess I will be buying plants in May. There is still time yet, so fingers crossed! Today I filled paper pots and planted parsley, basil, pineapple tomatillo and cumin. I have never grown tomatillos before, I have never even tried one. Have you? I’ve seen them at the store and I have heard they make great salsa and I always like to try something new every year and these are it. The catalog description says these actually taste like pineapple. Now, I don’t expect they will, not exactly. In a blind taste test no one will be fooled. However, I expect they will be pineapple-y, a little sweet-tart and kind of fruity. Since they are an experiment we’ll see how it goes! The weather forecast for the coming week is up and and down temperatures but always above freezing even at night. That is just crazy for this time of year. March has traditionally been one of our snowiest months and the precipitation predicted for mid week is rain, not snow. Looks like it is time to get out and start cutting back last year’s perennials and prairie grasses. Too early to remove winter mulch yet. This week might be warm but next week could be a blizzard. Not likely considering weather trends, but one just never knows. One last thing. That photo over there is what reading in bed at night is like for me. Dickens is on my lap and that’s Waldo curled up next to me. Bookman took the photo this week because he thought it was so funny. But this is not unusual, this happens every single night. If it doesn’t then there is something out of the ordinary going on. So now when I talk about reading in bed, you can fill in some of the details of what that looks like. Looks like the coop is coming along great! What a cute picture of you and the kitties. Very cozy. The coop sounds like it’s making wonderful progress! Y’all are awesome geniuses! I love the green salsa made from tomatillos. But I’ve never tried growing any. Have you attempted to give your pepper seedlings a boost with warmth from below? I don’t have a warming pad, but I do sometimes put the seedling trays on top of the oven after it’s been used, to absorb some heat. Sometimes they seem motivated by that to sprout the next day. Jeane, with luck we will get to try making some green salsa this summer! Thanks for the tip about the peppers. I haven’t tried bottom heat yet. Will give that a try and see if it wakes them up! The Coop looks awesome! I love the picture…comfy and cosy…not sure why Bookman found it funny!! Thanks cirtnecce! It’s getting there. He finds the cats funny because they do not do that to him! Dig those spaceman pajamas. 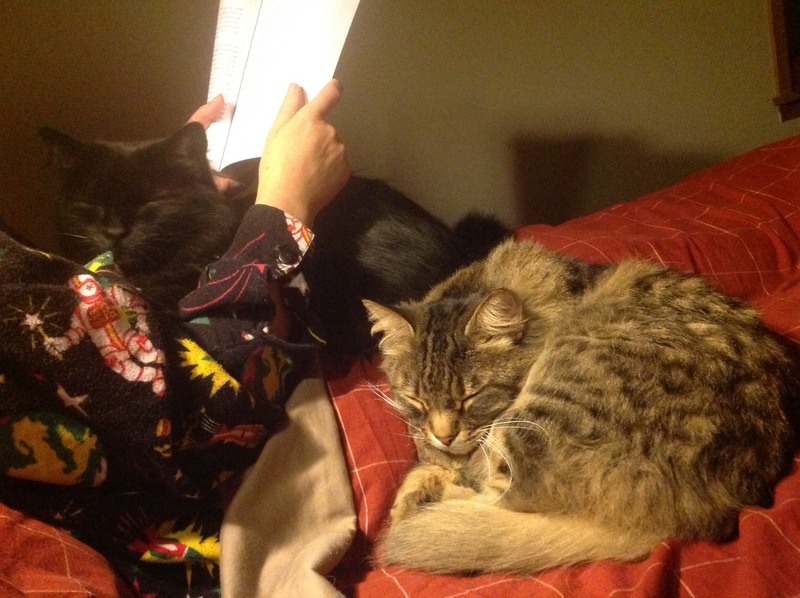 My cats like to be close, but won’t share my lap with a book – it’s all or nothing. Well done with the coop. I love that picture and I hope you get a chorus of purring! Ian, thanks! Oh yes, they purr really loud! That’s an impressive chicken coop. Your chickens will be the envy of any others in the neighborhood. Their house will be a “very, very fine house. With two cats in the yard…” Couldn’t help think of these old Crosby, Stills, Nash, and Young lines. This coop will be for some elite chickens! Jenclair, heh, that gave me a smile! 🙂 We are overbuilding a wee bit but we decided from the start that we would rather do too much and have things last a long time than to have to make repairs to a rickity building every year. Plus we don;t want the neighbors to think it an eyesore. 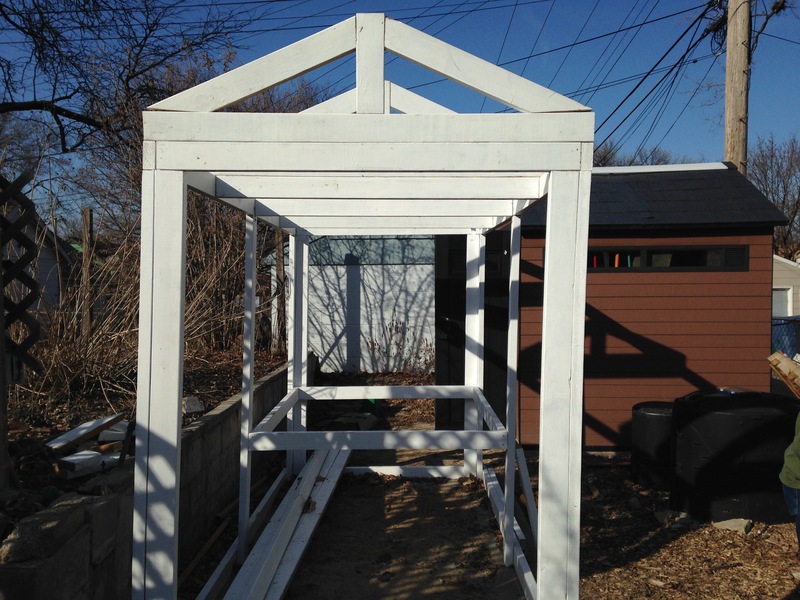 Very nice progress on the coop. I have to keep my bedroom door closed so the cats don’t come in…ever. Lulu is so huge she wakes me up by laying on my legs, and Blue snores. If I let them in during the day, they’ll hide from me when it’s time for bed. Lulu does sleep outside my door, however. And pounds on it occasionally. Grad, so cruel! 😉 I hear you though. It has been a long time since I have not been woken up in the middle of the night by a cat jumping onto my stomach or licking my arm or sticking his whiskers in my face. I don’t have the fortitude to lock them out of the bedroom at night nor do I trust they won’t get into trouble elsewhere in the house just to spite me! I love your cat picture. I have a cat like that – any time I sit or lie down, she is on me! Laila, hooray! I hope your tomatoes grow big and strong. The cat I had before these two was not of the affectionate sort and I longed for a kitty that would sit in my lap. Now it is a case of be careful what you wish for! Deepika, heh, no what they really want is for me to put my book down and give them all my attention! I bet they’re better than hot water bottles! We had snow on and off at the weekend and last night it was -8 celsius, but it’s to warm up by the end of the week. The weeds seem to have grown all winter though. piningforthewest, oh my gosh, they are like little mini heaters! Brr, it got chilly at your place! I hope the cold snap and snow has not hurt any of the things that had started flowering. Looks like an early spring there. Doing outdoor projects in March sure is wonderful isn’t it? Love that rafter. I can see you’re going to have a beautiful garden this year again. Way to go, Stefanie. BTW I’ve been away, still am, and haven’t touched Guermantes Way. Another year’s delay? O and that Finale of Downton is a nice wrap. My interest has shifted to Edith from Mary in this last Season. Aw. I love the picture of your cozy kitties. How fun! I spent the weekend gardening – I’m eager to see how it goes! The rafters look great. So wonderful you had a productive time and feel good about your progress. Cluck cluck time is getting close. Yes. I have tried tomatillos but only once I think and I really can’t recollect it. Good luck with growing it! Sorry, but at least you know I’ll never lie to you, or makes things up! Yay–your coop is looking great. They are going to have one fancy house to live in when you get your little chicks! Love the reading photo–I miss having kitties to lounge around with! Danielle, thanks! It is going to be rather fancy. We are totally over-building. The kitties are wonderful to lounge with as long as they let me read, sometimes it is a battle!